We have the experience and expertise to offer a wide range of top quality services to meet all your needs and requirements. Call us today for more information. 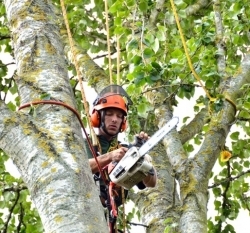 Our team of expert tree surgeons and hard landscapers in Milton Keynes and Buckingham provide work to the highest standards. Local Landscapes team of tree surgeons and hard landscapers cover the areas of Milton Keynes, Buckingham, Winslow, Aylesbury and Towcester. Local Landscapes offer tree surgery and hard landscaping services in Milton Keynes, Buckingham and the surrounding villages. Local Landscapes is a small business consisting of three guys who are all qualified and capable of using the latest professional equipment that make the job not only efficient but also safe. We take great pride in being able to offer a friendly, reliable service in a professional, efficient manor from the free no obligation quote to the finished job. Our work is guaranteed and the company is fully insured with £5 million liability. Safety is of great importance to us with all staff highly trained in safety procedures and how to use the latest equipment. Equipment is safety checked weekly and LOLER inspected every six months. A full risk assessment is completed before each job. 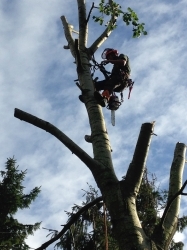 We offer a wide range of tree management and preservation services including tree felling, crown reductions and shaping, crown lifting, coppicing, pollarding, log splitting, hedge cutting, stump grinding and many more. We will also apply for any permission required in conservation areas or for trees with preservation orders. Hard Landscaping services include digger hire with driver, decking, concreting and fencing. We will always complete work with care and attention taking into account surrounding wildlife, with minimum disruption to your garden or site. Waste can either be left on site or taken away to be recycled - logs are seasoned then sold as firewood and all other waste is composted. Local Landscapes was established in 2002 carrying out groundwork's from drainage, to driveways and patios using both slabs and block paving. As demands increased our services have expanded so we now have a wide range of equipment and qualifications enabling us to carry out many aspects of hard landscaping and tree surgery by fully qualified NPTC tree surgeons. We are ideally suited to cover the following areas: Milton Keynes, Buckingham, Bletchley, Stony Stratford, Winslow, Aylesbury and all the surrounding villages. Please look at this site for a more detailed description of the services that we offer with pictures of jobs that have been carried out in the past. Click on the link to our Facebook site for regular updates on what we've been doing. Any questions then do not hesitate to call or email using our contact page.